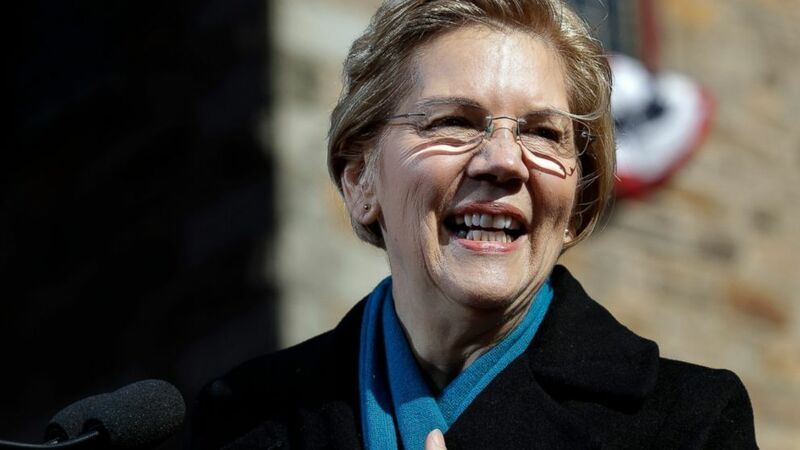 Back in Iowa as a full-fledged presidential candidate, Democrat Elizabeth Warren took aim at President Donald Trump on Sunday, saying he "may not even be a free person" by next year's election. The Massachusetts senator also urged fellow candidates to avoid letting Trump define the contours of the election with his personal and provocative attacks. "Every day there is a racist tweet, a hateful tweet — something really dark and ugly," Warren said as she opened an event in Cedar Rapids. "What are we as candidates, as activists, as the press, going to do about it? We're going to chase after those every day?" Warren has been a frequent Trump target. Hours after she formally kicked off her campaign on Saturday, the president renewed his criticism of her past claims of Native American heritage. In a tweet, Trump called Warren "Pocahontas" and said he would see her "on the campaign TRAIL." The White House didn't explain what the president was referring to in his tweet, though some Democrats accused him of making light of the Trail of Tears — the forced removal of Cherokee and several other Native American tribes from their lands in the 1830s. Warren's campaign wouldn't say what the senator believes Trump was referencing. Warren emerged as one of the Democratic Party's fiercest and most effective Trump critics during the 2016 election, campaigning vigorously for Hillary Clinton. But she's largely avoided talking about Trump since she began testing the waters for a presidential campaign more than a month ago, hewing more closely to the populist economic message that has long made her a favorite of liberals. That shift made her sharp, though brief, shot at Trump on Sunday all the more notable. "By the time we get to 2020, Donald Trump may not even be president. In fact, he may not even be a free person," she said. Warren told reporters her comments were a reference to the multiple investigations that have shadowed Trump's presidency. Asked if she supported impeaching Trump, Warren was noncommittal, saying only that special counsel Robert Mueller needs to be allowed to finish his investigation and make his report public. "If we go down that path, we're going to need to help pull this country together and have as many people as possible understand it was a legitimate process based on facts," she said. Trump has not been charged with any crimes, but several of his former advisers have pleaded guilty to a variety of charges. The president's ability to create controversies and drive debate poses a challenge for Warren and other Democrats. While Democrats are eager for candidates to show they can handle Trump's aggression, they also risk overshadowing their own visions for the country if they respond to every attack or provocation. Warren's campaign launch has been shadowed by the controversy surrounding her past claims to Native American heritage. She's apologized for claiming Native American identity on multiple occasions early in her career.